The Black Sea resort of Sochi will host the Russian Grand Prix between 2014 and 2020 after agreeing a deal with F1 supremo Bernie Ecclestone. The deal, which will reportedly cost Russia £25m a year, also includes an option to extend it by five years. "It can be a super circuit," said Ecclestone. "It's all the things we need and wanted and we are very happy." However, the opening Russian GP could take place in 2015 as Sochi is also hosting the Winter Olympics in 2014. Deputy Prime Minister Dmitry Kozak raised the possibility of putting the race back by a year if it affects preparations for the Winter Olympics. 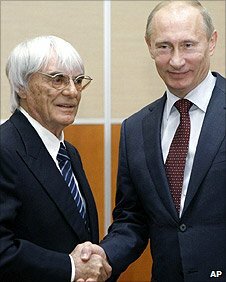 Ecclestone, who has been trying since at least 1982 to take F1 to Russia only to see plans for races in St Petersburg and Moscow collapse, praised the country's sports officials, adding: "They are trying to build absolutely first-class facilities both for the Olympics and Formula 1. "I sincerely hope that Formula 1 is going to play a big part in what I can see happening in Sochi." Russian prime minister Vladimir Putin, who attended the signing in Sochi, met with business leaders separately to encourage them to support the grand prix. And Putin hailed the move as a good way to satisfy calls from the International Olympic Committee for a Winter Olympics legacy. "For us it's an important event because it would be possible to use effectively everything we have created for the Olympic Games in 2014," said Putin. Ecclestone is keen to expand the sport to new parts of the world with Singapore, China, Bahrain and Abu Dhabi added to the F1 calendar in recent years. And South Korea will host its first ever grand prix on 24 October, despite concerns as to whether the venue would be ready in time. A new race will take place in India from 2011 - taking the schedule to an unprecedented 20 races - while it was announced earlier this year that F1 will return to the United States from 2012 at a new track in Austin, Texas. Ecclestone has said that 20 races was probably the limit for the sport, which could lead to other races being dropped. Two European races that secured their futures this year were the Italian Grand Prix, which will remain at Monza until 2016, and the Monaco Grand Prix, which signed a new 10-year contract in July. In December 2009 Silverstone signed a 17-year contract to host the British Grand Prix. Ecclestone told BBC Radio 5 live earlier this year that it was more important to be in Russia than anywhere else in the world at this moment. "The only question mark is Russia, where we should be and we are not," he said in July, when also revealing his interest in taking F1 back to South Africa. This year, F1 has its first Russian driver in Vitaly Petrov, although he has struggled to perform consistently and his future at Renault has been the subject of much speculation.